Learning is never measured by age. This was proven by Joseph Alba, 52 years old and a farmer. 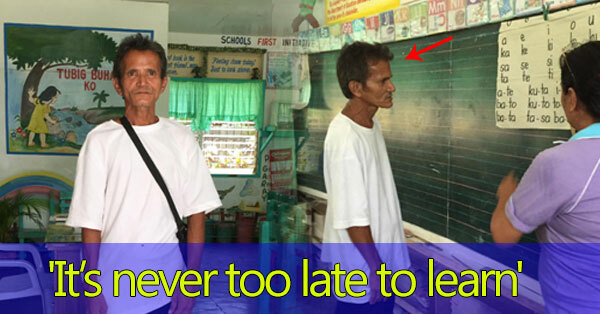 This old man did not pursue his education because of the death of his parents way back when he was in his 3rd-grade. After that incident, he decided to work on a sugar cane farm but stopped in 2013 due to his old age. Later on, he found himself in the hands of the Pasingca Family as their helper. Days passed, Alba became closer to the family and even observes and sits beside the second-grade daughter of the Pasingca’s as she studies. And just like other people who haven’t pursued their education, Alba was bullied. But this bullying didn’t stop him from believing that it is never too late for him to learn. Showing great determination and courage, the Pasingca family took him back to school. Like a kid, Alba bought uniforms and was provided a pocket money worth of Php5 to Php10 a day. Fria Laguda, Alba’s teacher, described the man to be a fast learner and served as a model and an inspiration not only to the kids but to all of the people who are losing their hope. As he sat inside the room, flashbacks from his past played back in his mind and reminded him of the old days when he used to skip classes. For him, it would soon be easier for him to read locations, street signs and directions when going to school. In the present, Joseph Alba is determined to finish his studies in Vicmico Elementary School in Manapla, Negros Occidental as a 1st grader. He plans to finish elementary and thought of teaching the children on the importance of reading.